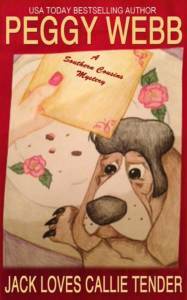 (Print version only contains the Southern Cousins Mystery series prequel, Jack Loves Callie Tender, a novella and companion guide). Mooreville’s biggest secret is out! The stork’s flip, flopping and flying toward the Jones household. Callie’s in a fever and Jack is all shook up. He sets out to ensure nobody can get near his wife and future child, stopping just short of building a mote around the house complete with crocodiles. Ruby Nell throws a big party to celebrate. While the guests are rocking around the clock and eating Lovie’s sausage balls, the King in a basset hound suit unearths some blue suede bones. Who do they belong to and who put them there? Ruby Nell becomes the chief suspect. But there’s more than one devil in disguise at her party. While the nervous expectant father is out of town, the Valentine women go into full sleuth mode. Can they find out who’s been steppin’ out of line and solve the cold case before The Company’s most lethal operative returns to find his mother-in-law singing the jailhouse rock? Cousin Lovie’s in the kitchen and murder is on the menu. 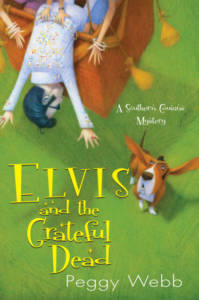 Join the Valentine clan plus Elvis in a zany romp with a whole lotta cookin’ goin’ on. Callie’s hunk’a burnin’ love is in parts unknown so she heads to a cooking competition on the Gulf Coast with cousin Lovie where the only trouble her mama can get into is sunburn. But somebody is out to win, come what may. When the first victim goes missing and the body won’t stay put, Mama and her best friend Fayrene, the queen of Maloprops, try to save the day while the rest of the Valentines go into a fever. Adding to the mayhem are more suspects than Elvis has fleas, a bunch of master chefs gone amok and a couple of bumbling underworld criminals with kidnapping on their minds. Can everybody’s favorite hound dog, Elvis, save the day before Mama becomes the next victim and suspicious minds put the blame on Lovie? 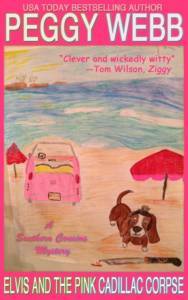 Reviewer’s compare this hilarious romp to the movie, Weekend at Bernie’s. The secret is out! Jack and Callie have decided to have a baby and the whole Valentine clan is offering bad advice. Join the fun and as a bonus, enjoy soup recipes from cousin Lovie’s kitchen. To prepare for their future blessed event, Callie and Jack attend baby boot camp where they are given their very own rubber “baby.” Callie can’t help falling in love, but Jack’s all shook up. He heads out of town to help an old buddy, but it’s his turn to baby sit so Callie straps Rubber Baby to his Harley. While Jack and Rubber Baby head to Heartbreak Hotel, a pacifier comes up missing at baby boot camp and there’s a whole lotta crying going on. Then a killer targets the Valentines, the Company sends in a new hunk’a burnin’ love, and the whole family goes into a fever! Can Elvis save the day before bad boy Jack backs out of fatherhood and Callie becomes the next murder victim? You’re invited to the most anticipated wedding of the year! 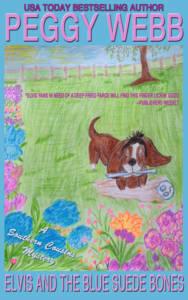 As a bonus, enjoy the short story, ELVIS AND THE DEADLY LOVE LETTERS, plus recipes from cousin Lovie’s kitchen! Callie is finally saying “I do” again! Lovie’s throwing a bridal shower, Mama’s making plans for grandbabies and Elvis is searching for a four-legged tuxedo. But somebody out there is looking for T-R-O-U-B-L-E. When they kidnap the bride and the bridesmaid (Cousin Lovie), they’re the ones who end up crying, “Help me make it through the night.” Callie’s got a suspicious mind, and Lovie’s got a piping hot skillet that has the criminals begging don’t be cruel. 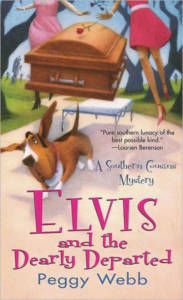 Can Elvis sniff out the crime in time for the nuptials or will hunky Jack Jones be left crying in the chapel? This cozy has it all – wedding cake, high heels, a bad boy on a Harley, and a famous dog. With the killer who hates Christmas behind bars, the Valentine gang has turned their thoughts from murder to weddings…until the bridegrooms start turning up dead. The first groom is found in Hair. Net with Callie’s haircutting scissors plunged into his neck. To make matters worse, another bridegroom turns up dead at her wash and rinse sinks. With Callie as the prime suspect, the Valentine gang starts rocking around the clock to prove her innocence. But it takes a dog like Elvis to catch a killer and keep all the Valentines safe in time to ring in the New Year. It may be Christmas in Tupelo, but there’s precious little peace in the valley for the Valentine gang. 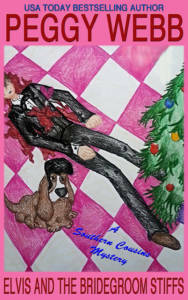 Jack is trussed up like a holiday turkey, recovering from a shattered leg at Callie’s house; Cousin Lovie’s on the rebound, looking for love in all the wrong stockings, and Elvis is out for revenge on the Lhasa Apso who’s been singing “Merry Christmas, Baby” to his sweet French poodle. Everyone finally gets into the spirit when Uncle Charlie is pressed into service as Santa at the weekend charity event in the mall. But Yuletide cheer turns to Yuletide fear after a killer marks Uncle Charlie “Return to Sender” and tries to zap him back to the North Pole. For good measure, the killer sends Rudolph to the big reindeer pen in the sky. Determined to find out who’s decking the mall with Christmas corpses, Elvis and the Valentines fill up their sleigh with suspects. 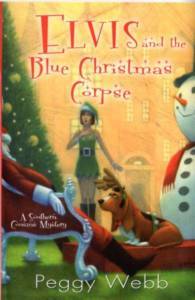 But can the Valentine gang catch the holiday killer in time to turn their blue Christmas white? 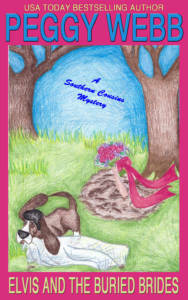 When Lovie invites the whole Valentine clan to visit her brainy new beau’s archeological dig, Callie packs up her crooning basset hound and heads straight for T-R-O-U-B-L-E. At the dig Elvis digs up a skeleton too fresh to be part of the research and too dead to spell anything but homicide. Ruby Nell and Fayrene blame ghosts and gods, but Callie knows the guilty party is all too human – and for once, she’s determined not to get involved. 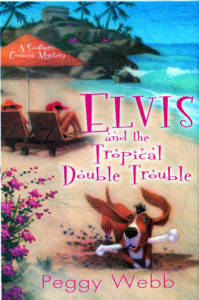 But when Lovie and Elvis go missing, Callie jumps knee-deep into trouble. It’s now or never if she wants to save her cousin and her canine from someone who’s always got murder on his mind. 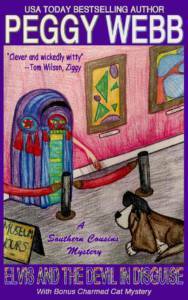 Callie mama, Ruby Nell has gone and entered herself in a Memphis mambo contest, hoping to shake, rattle and roll her way to stardom. And she’ll need everybody in the family to chaperone! 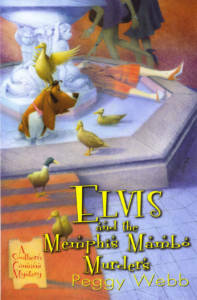 The Valentine gang and Elvis head to the grand old Peabody Hotel. But someone at the competition is determined to step on a lot of blue suede shoes. With dancers dying right and left and Mama next on the list, can the cousins catch a killer so Ruby Nell Valentine can waltz on home in one piece? When one of the Elvis impersonators keels over mid-swagger at Callie Valentine Jones’s party, suspicious minds put the blame on cousin Lovie. Callie and the Valentine gang go into sleuth to find the real killer. Could it be Texas Elvis, who has sworn to out-swivel his rivals? Maybe the female Elvis from Australia? Or one of the endlessly bickering officers of the Elvis fan club? It’s a mystery fit for a King. 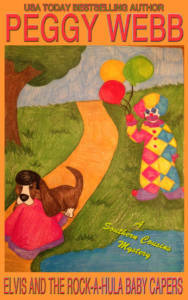 Callie and her talented hound dog Elvis shake, rattle and roll to catch the real killer before cousin Lovie fries in the chair instead of the kitchen. Callie Valentine Jones spends her days in her little beauty shop, Hair.Net, fixing up the hairdos of the glitterati of Mooreville, Mississippi (population 650) and her evenings at Uncle Charlie’s funeral home, Eternal Rest, prettying up the dead. When the corpse of local prominent physician, Dr. Leonard Laton, goes missing, Callie and cousin Lovie set out in hot pursuit of the recently embalmed, last seen bound for Vegas. With the poisonous Laton family tree providing plenty of rotten suspects, Callie’s determined to crack the case – with a whole lotta help from Jack, the irresistible hunk who is her almost-ex husband.